Took the Mini out for a test drive so see how the BFGoodrich G-Force Comp-2 A/S ultra-high performance all-seasons cope with something other than mountain roads and autocross in the summer and the rain. 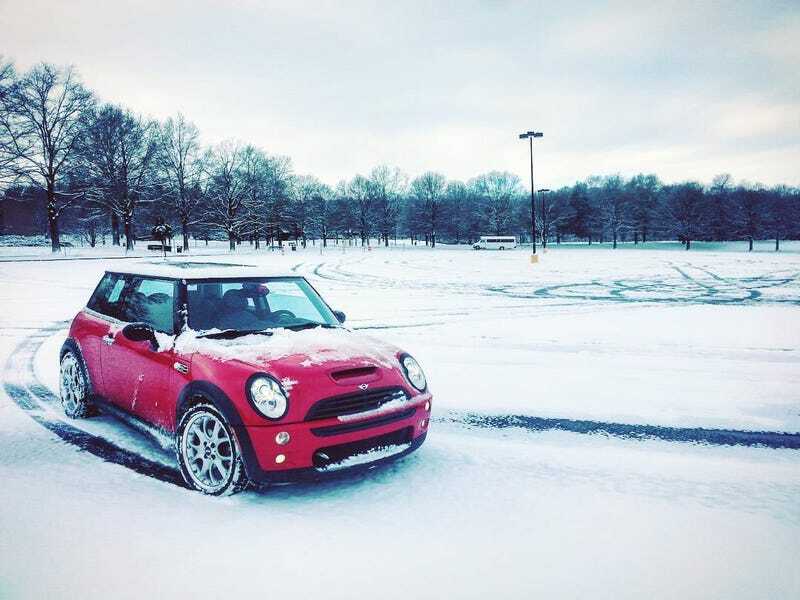 Mini Cooper S is exploring the snowy streets of Greenville, SC! A wild Parking Lot Appeared! Mini decides to head back home and get ready for work. A wild Steep Hill appeared! Mini used Slalom and Gun It! Mini ran away and found another way home. In summary- braking isn’t too bad, so long as you give yourself plenty of room and slowly increase braking pressure. Traction on flat ground and fairly light hills isn’t awful, so long as you keep it out of the boost. Turning is best handled with slowing down before the corner, turn in and add a “lil’ bit o’ handbrake”, then ease onto the throttle while steering where you want to go. This car handles oversteer way better than understeer, so it’s best to just oversteer in advance rather than try and recover from understeer. Braking going DOWN a steep hill isn’t awful, but trying to drive up one results in just lots and lots of wheel spin. Overall, I think the Mini can handle getting to work and back with just a little pre-planning. When I bought the tires that are on it, I was hoping to have the Audi all-fixed up in time for snow, but life had other plans.